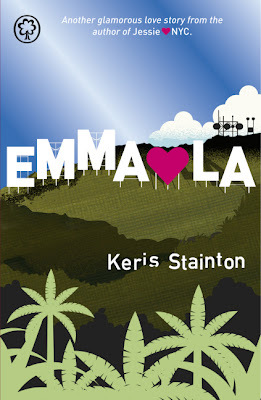 Emma's just arrived in Los Angeles, a million miles away from all her friends, and any chance of a boyfriend. Unless you count geeky Oscar - which she doesn't. Teen heartthrob Alex might have potential too. If she can get him away from the prying eyes of the paparazzi, that is. Two boys, unlimited sunshine and a new life amongst the stars. Maybe LA's not that bad, after all. I knew I would love this book as soon as I saw it. Firstly, Keris Stainton's other books 'Della Says: OMG!' and 'Jessie Hearts NYC' are both fabulous and I thoroughly enjoyed them. Plus, I have always loved LA - I've never been, but it just sounds like an amazing place and now I've read this book, I want to go there even more! In this story, teenage girl Emma moves to LA when her mum gets offered a new job. Emma doesn't really want to go, but gives it a try for her mum and sister's sake. When she arrives in LA, she is reunited with childhood friend Oscar, and he shows her everything the area has to offer. But then she has to accompany her sister Bex to a casting for a TV show, and she meets Alex - a famous TV actor - and she has to choose what she really wants from life. This is an ideal summer read, perfect to take with you on holiday! It's such a fun and exciting story. Emma was also in Jessie Hearts NYC, so it was nice to catch up with her and find out what has been going on in her life in this book. It was a bit like catching up with an old friend. It's lovely to read about the close relationship she has with her mother and younger sister. Emma's witty narration made it easier to relate to her, and I loved drama-queen sister Bex - she was so determined to get what she wanted it was inspiring, and she had real depth as a character. Both love interests were awesome, but I'm definitely more a fan of Oscar. He's funny, interesting, loveable and a total geek! I didn't really like Alex that much. It was nice that he offered to help Emma's sister Bex learn her lines etc, but it seemed all he wanted from Emma was the publicity - 'Who's the new girl, Alex?'. I read Emma Hearts LA the day I got it, and it left me feeling cheerful and sad. Cheerful, because it's an amazing book, but sad because I really didn't want it to end! It's a very fun book to read, but I recommend you read Jessie Hearts NYC before starting on this one. I think all readers aged 12+ would enjoy this. 5/5! Oscar is mine, Amber! I won't let you steal him from me!